Dear Senator Poe. Why your time is now. Please allow me to be direct. I believe it is a quality you very likely appreciate. You are an intelligent and respectful woman. You have what many in politics miss or what is driven out of them after a few years of believing their own political puffery. You have humility. It is a refreshing quality. But I fear that humility is your weakness right now. You believe that you do not yet have the experience necessary to run this nation. To be its Chief Executive Officer. You want to wait a few years. What is government, after all? It is a moving freight train. It is not an event that stops and starts with each new presidency. It has people in place, career people. It has managers in place who want only to prove that they are capable. Government runs day and night, weekends and holidays, through thick and thin and all kinds of weather. It runs when Presidents are traveling or in the hospital or on vacation or between administrations. Government stops for no human. Not even the President. Slipping into the presidential office is just doing what any other newbie would do on his first day on the job. Awkward, yes. Impossible, no. By the end of the first week, things would be falling into a regular order. The number of executives who would report to you is a short list, most of whom you would probably retain in their current positions. They all would want you to succeed, not fail. They would be on your side, 100 percent. They only need a road map. Or a question now and then to suggest a direction. A nudge. A recommendation. Someone willing to take that final risk, where the buck stops. Do you really think you would fail? If you are hesitant to run against family friend Jejomar Binay, or reluctant to supplant the good Mr. Roxas as a candidate, or for other personal reasons, I’d suggest that you forget those reasons exactly BECAUSE they are personal. They are minor in the greater scheme of things. Much more important is the well-being of this nation. Perhaps you don’t hear it yet. But you are being called. Respectfully, Senator Poe. Waiting is a mistake. It is a mistake for the Philippines. It is a mistake because it presumes that the next president will continue Mr. Aquino’s move along the straight path. The 2016 election is a make or break historical moment for the Philippines. It is a choice between continuing the straight path or reverting to the manipulations of power and favor that coddle the entitled and disregard the well-being of the masses. It is a choice between progress and regress. Straight path, or entitled path? Progress or regress? Which will it be? Will you really let the children of the Philippines face that choice? Every candidate will claim he or she is THE candidate to continue Mr. Aquino’s legacy. Most will even brag that they can improve upon it, never mind that they do not have to do what he did: go against a deeply entrenched, highly critical, corrupt society. They need only go with the flow that Mr. Aquino worked so diligently to establish. But braggadocio is politics. Politicians work the words, spin the facts, massage the image. And condemn respectable opponents because it is a win/lose game. But they all have baggage. Every candidate. I’ve checked. Some of the baggage is real. Some of it is imagined. Some of it is slander, one politician to another. Take any name on the prospect list. That candidate can be sliced and diced by a powerful political machine. It is so easy that I could do it. You could do it. Find the flaws, real or imagined, and dig at them. But that kind of blood and gore should not be necessary. I think it is not really your style, and that may be in part why you are hesitant to run. You saw what the nastiness of politics did to your father. But my observation is that you are different from the ordinary candidate. For while you bear the popular imprint of your father, you also stand on your own for the good works you have done, the high character you represent and the charm and intellect you display. You tote no luggage. Well, perhaps a small carry-on bag, but it is of no real significance in the greater scheme of things. The opponent who tries to smear you is likely to come off as Beelzebub slandering an angel. Your career origins are the movie business. I am reminded that the United States once had a president who emerged from the film industry. His name was Ronald Reagan. Many wrote him off as a lightweight, his credentials being acting and presidency of the Screen Actor’s Guild. But he proved them wrong and was elected governor of the great state of California. And then as President of the United States. He became known as the “teflon man” because political criticism would just slide off of him on the strength of his personal charm, good humor and intellect. You have a similar aura. Different in style, but you connect, just as Mr. Reagan did. When you speak, people listen. And they listen with an open mind. Do you realize how rare that is in the Philippines, that people want to listen rather than opine? That people believe they can learn as well as instruct? I’ve studied things here in the Philippines for almost ten years now, and that quality is rare. And it is precious. Because you have that gift, you can tear down walls in the Philippines, those that pit Filipinos against Filipinos, the rich against the poor, and the cities against the provinces. You can continue the straight path like no other candidate. You see, you are not a traditional politician, one of the “trapos”. Please run before you become one. Before you are caught up in the wheeling and dealing of favor and power, of debts granted and owed. The Philippines needs to operate outside the bindings of the old ways of doing business. It needs fresh thinking. It needs new ways and new directions. It needs your character, your intellect, and your leadership. For the kids . . . and for their parents. I ask that you run for president in 2016. Mother Lily with her magic wand is totally behind you…. and that’s another plus in your winning. Let’s pray that the ruling party will pick you as their candidate and make Mar Roxas your VP…. But hell, why not go all out for a change – get Cong. Leni Robredo as your VP! I like that she is not closing her doors. It is often said that the presidency is a destiny and let’s hope that it is hers. It is a destiny and sometimes if you don’t accept “the moment”, it passes, never to return. Thanks for that glimpse of the lessons she brought back from the U.S. I tell you, this is a very smart woman. She sees things. Thank you, Joe A, for articulating what I have been trying to tell my family and friends since last year. I even sent Sen. Poe a long email appealing with her to consider running for president in 2016. I see her as the only hope we have against the looming specter of a Binay rule. I have shared it by email, Facebook and Twitter. I hope she get to read this. And yes, I totally agree having Cong. Leni Robredo as her VP! You are a part of the “calling” that I am hoping she will hear. I desperately wanted Sen Poe to hear the “call”. So other than posting your article in Twitter, Facebook and email, I sent the link by PM to all the FB pages of Grace Poe and, (*shameless*) even to her son’s. Which turned out to be a good move because he replied. He thanked me for taking the time AND assured me that he will make sure his mother reads it! Ah, here’s to shameless acts aimed at the betterment of our nation! She needs stronger arguments on how disastrous it would be if anybody from Binay’s camp makes it back to power. I sent you an email on a short piece, written in the euphoria over the San Antonio Spurs championship. Hope you consider printing it. Tnx. Got it Andrew. It will publish Thursday. Miami got stomped. No question. God save the Philippines if Binay were to be president. It’s likely to be more of a disaster than the Estrada admin. Erap was too naive, Binay is too cunning. Cunning. Yes, that is a disturbing quality. Poe and Robredo would be a good team, and a winnable one. Hope she reconsiders soon. Robredo and Poe. Unblemished. Intelligent. Capable. Hearts in the right place. Either will do for me although I prefer Leni Robredo. She is not just the widow of Jesse Robredo. She can stand on her own as a lawyer, a community organizer, and a public servant. When she goes to her district in Bicol, she takes a public bus when her car is unavailable. At her district, she takes bancas to visit far flung seaside barangays not accessible by land transportation. She has organized women in her district so that they can participate in their community’s affairs. But she has the same humility problem as Grace Poe. Both ladies prefer to do their work quietly. They are both too low key when they should be at the forefront so that people can see the contrast between them and politicians posing as public servants. Leni Robredo was my first choice for president and Poe VP. But thinking about it long and hard I concluded that Poe has a stronger chance of beating Binay. Yes, exactly. It is her wild, widespread popularity, drawn from her father in part, that would offset the Binay popular draw. It is THE key factor, looking at it tactically. Robredo in 2022 perhaps.
. . . so that people can see the contrast between them and politicians posing as public servants . . . YES indeed. The distinction between actors and leaders, deceit and integrity. When Grace Poe joined politics, there was a subtle idea of dismantling the bad politicians specially those of Gloria Arroyo alike characters as she strides along the course of political achievements. Whether she likes it or not, her good aura will bring her on top, the good contenders like Duterte or Trillianes and other presidentiables which has the same aspirations for the good of the country may give way…. Please Join Miss Grace Poe, You can do it!!! The sooner she announces, the sooner others can do their polls, look at the reality, and put their support behind her. She could save them a lot of money and embarrassment (from losing, heh heh). if only this will happen the people of the Philippines at last will have a leader worthy of their support and trust. Indeed. We can confidently say that, finally, Marcos style corruption – power and favor brokering – will be replaced by good work and honest dealing. I am a Bicolano, and I like what Leni Robredo is doing. But endorsing Leni Robredo to run for president against Binay in 2916 is like endorsing Binay because Binay would be salivating for that to happen, and we all know exactly why. Of all present aspirants, there is only one person who can beat Binay in 2016 and that is Sen. Grace Poe. I will go for Grace Poe, not just because she’s winnable but mainly because, based on her personality and good records, she has the moral ascendancy to continue the good and straight path of governance initiated by President Noynoy. So, Senator Grace, please heed the call of your people. For the good of our country, we implore you..
Hi Bert. The main weaknesses of Leni Robredo are: (1) she is accused of having been negligent in some P50,000 or so government deal, (2) she is relatively unknown, and (3) she has not proven herself on the national stage. “Of all present aspirants, there is only one person who can beat Binay in 2016 and that is Sen. Grace Poe.” I agree with that. Some say that Secretary Roxas, with the President’s backing, could win. It is the “could” in that assessment that bothers me. I believe Mr. Roxas would get chewed up in the publicity machine that Binay has. We need someone upstanding who WILL win. That is Senator Poe. what makes us think that the Binay machinery has not compiled some dirt on her? remember the VP was the campaign manager of Ronnie Poe then in his bid for the presidency. I think there would be dirty play, a re-emergence of the “Marcos child” denigration, or charges that she has accomplished exactly nothing, versus our ability to look at the shining towers of Makati, which we know Binay built by hand. 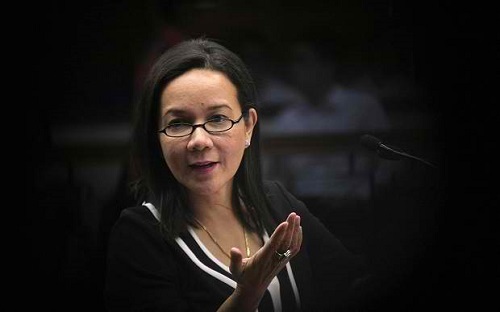 I expect Senator Poe to retain her dignity, maybe a bit of humor, and to concentrate on the issues. Maybe turn the charges inside out by saying it is exactly that kind of rumor and dysfunctional dirt-throwing that we want to avoid, as it does not speak well for the Philippines. She can recall how her father, a good man, was defeated because of such shenanigans and in that way, paint the critics as bad people. Of more concern to me is that I think Binay’s personal outreach, through mayors and governors, will be out face to face with poor people recruiting them. Intimidating, buying, convincing, enrolling. It is a machine. Hi Bert. The main weaknesses of Leni Robredo are: (1) she is accused of having been negligent in some P50,000 or so government deal, (2) she is relatively unknown, and (3) she has not proven herself on the national stage. I think she probably could not get the big-money backers that Senator Poe can. “Of all present aspirants, there is only one person who can beat Binay in 2016 and that is Sen. Grace Poe.” I agree with that. Some say that Secretary Roxas, with the President’s backing, could win. It is the “could” in that assessment that bothers me. I believe Mr. Roxas would get chewed up in the publicity machine that Binay has. We need someone upstanding who WILL win. That is Senator Poe. Character, capability, popularity, financial backing. I don’t find any of the candidates impressive enough for the position. They lack one or several traits I am looking for. However, I would choose Poe over Binay only because she would win. Binay the opportunist should not win, there’s a chance he would sell this country to China given the right circumstances. Ah, yes, it is hard to see regular people stepping up to lead a nation that is complex and striving to find itself a new demeanor, other than power and corruption. But then, Mr. Aquino was not all that impressive when he was called, and he has grown immeasurably and dealt with a lot of tough issues intelligently and firmly. It is interesting to me how even so called dignified statesmen (like senators) would rather tear the nation apart than concede they made mistakes in accounting for the money that passed through their offices. The Senate Ethics Committee should shut the accused senators up, for they are creating a very distasteful and acrimonious scene. Actually, I do believe his father had demonstrated his ability to get things done by managing his independent production studio to considerable success, and breaking the lock that the power producers had on the Philippine film industry. But, yes, I think his political success was tied to his popular aura, much as Manny Pacquiao figures his will be when he decides to stop coaching basketball and boxing to take the time to run for president. But Grace Poe does understand politics well, and has enough engagement to move to a chair where her high values and intelligence can be put to good use. if ever grace poe accepts to run for prez in 2016, she should make herself clear on how she would deal with the marcoses and their ill-gotten wealth and if she would allow a marcos burial in the libingan ng mga bayani. if she fails to satisfy me on these two issues, i’d shift my eyes to the other presidentiables except binay and bongbong marcos. Those are reasonable qualifications. I would be disappointed if she did not actively seek return of the stolen money or allowed Marcos’ burial in a cemetery that might be construed as honoring his deeds. This is just my personal opinion as a Filipino whose only concern is the interests of the country after the term of the present president. What we are looking for here is a president succeeding Pres. Noynoy who can continue the implementation of good and clean government programs, the ‘daang matuwid’ of governance, that has been proven to be effective in uplifting the economic welfare of the country. We all know there are the anti-Marcos, and there are the Marcos loyalists, and there are the people in between who don’t mind the name ‘Marcos’ as long the government is doing what is good and right for the country. I think that the mentioned ill gotten wealth or the Marcos place of burial are not critical factors in the attainment of all good things we aspire for for our nation and people. Just my 2-cents worth of opinion.